We started our week off with a very good game – will we keep it up? Indeed, we will! Aggressive Daily Double hunting, solid wagering, and a wealth of knowledge have led us to this situation. Before Thomas received credit for “no decision,” bringing his score up from 8,400, things were more complicated; now, they’re straightforward. 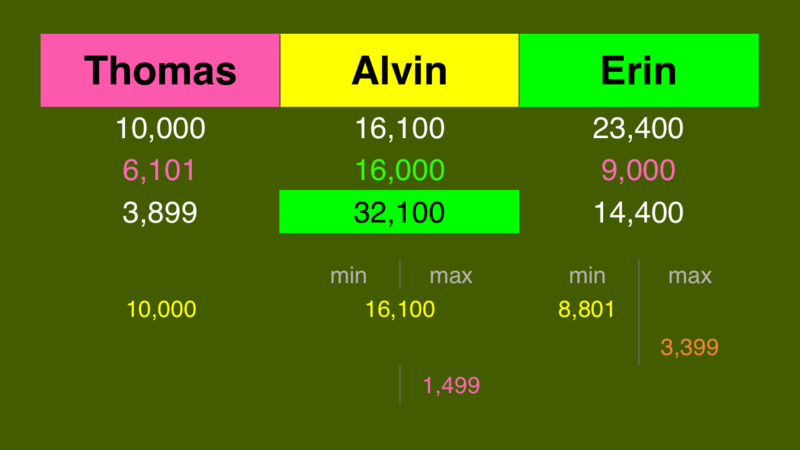 If Alvin doubles his score, he’ll have 32,200. To cover him, Erin will need to wager 8,800. 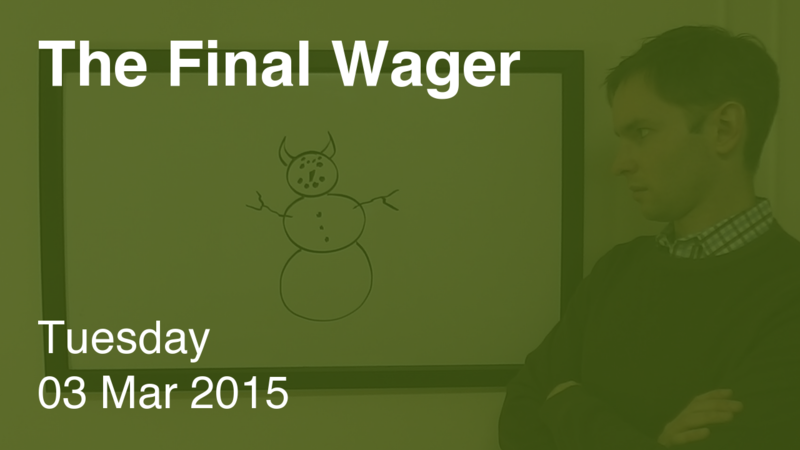 An incorrect response with that wager will leave Erin with 14,600. To stay above her total, Alvin can wager up to 1,500. Thomas must respond correctly to have a shot, so all-in is the way to go. A successful doubling will put Thomas at 20,000. To cover this, Alvin should wager at least 3,900 – but since he must get it right to have a shot, he should go for broke. Erin could wager at most 3,400 to guarantee a win against Thomas – but she’d risk having Alvin pass her. 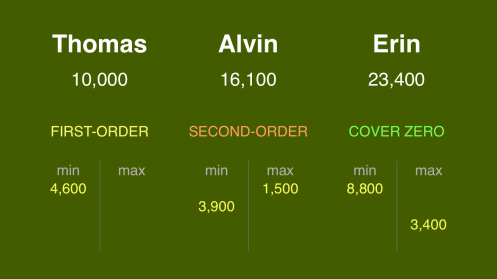 Had Thomas remained at 8,400, Alvin could have covered him with just 700, giving him a legitimate lower range (and possibly entering into some mind games with Erin). That’s basically all we have to do. Thomas gets pink because he fails to cover that possible (but bad) 1,500 wager out of Alvin. I don’t think that “smaller” wager from Alvin would be necessarily bad on the surface since it enables him to win on a triple stumper, but with the category in this game (not one that I think would generally be “disliked” as long as you’re an American) I think it’s broad enough that betting on getting it right is worthwhile. Just a question, what were the two other high paydays in between 36,400 and 32,200.